What do you want from your dog? One of my favorite questions to ask clients is, “what do you want from your dog?” This seems like an easy question to answer, but most people have a hard time with it. It may take them a few minutes to actually sit back and think about what it is they really want from their furry family member. Do you know what you want from your dog? Do you want a calm relaxed pup, or a pup that is always on the go? Do you want a dog that chases squirrels and cats, or one that can watch curiously, yet still keep walking past them? Do you want a dog that is polite with other dogs, or a dog that rushes up and assaults or mounts every dog he or she sees? I think it is obvious what most people want. Most clients want a calm, socially acceptable, and focused dog. Is it impossible? Well, if we follow the typical rules/fads/suggestions surrounding dogs and their training, then yes, it really is impossible. Our society sets dogs up to fail by conditioning them to do the exact opposite of what we would like them to do. So, is that all I can say to people? That they will never achieve the goal of having a calm dog? No, of course not. I have an entire pack of “high-energy” breeds that are calm, socially acceptable, and focused. This is not because I am a magician. I do not have fairy dust to sprinkle on them. I simply condition my dogs to be the way I want them to be. For the last 10 years, I have been teaching people how to keep dogs calm. I am happy to see that this is now becoming a “thing.” However, please keep in mind you must not confuse your pups. You must stay consistent in all areas, meaning, if you really want them to be calm, teach them to be calm with all dogs. If you want them to “shut-off” in public, practice at home, etc. Chase/Prey drive…..all dogs have it; some can’t control it, others we condition to increase their prey drive by our daily routines. If you do not want your dogs to chase squirrels or cats, please do not play “Where’s the squirrel? Where’s the Cat?” game with them. Of course they are going to chase those little furry critters if they think you are ok with it! Oh, and they may even try to chase “Fluffy,” the little poodle up the road, because you said it was ok to chase little furry creatures. Hunt/kill….why?? Here is the real thought behind this: “lets teach a dog to chase a little furry thing at the end of a line back and forth, until their pupils are so huge they can’t even see straight, all in the name of….exercise?” Please go walk your dog in a calm and working manner. Don’t teach your dogs to chase and kill. We play with CATS this way to teach cats to catch and kill small animals. It enhances their ability to hunt. Do our domestic dogs really need this? No. True exercise=walking your dog. Improper play/dog parks and daycare…. There are very, very few dog parks and doggy day cares I will recommend. Why? Because dog parks and daycares have become an excuse to exercise dogs instead of walking them. A large percentage of dog owners now head to the dog park so they can let their dogs run loose and beat up on other dogs just to get “exercise.” Dog parks without monitoring are one of the main reasons we see an increase of reactive dogs. Honestly the Dog House Drinkery is the ONLY place in Central Texas (that I have witnessed), that truly monitors for proper dog play in their dog park. They do not allow biting, crazy chasing, mounting, etc. They strive for proper social skills, calm interactions and maybe an occasional quick chase. If you are going to a dog park or sending your dog to a doggy daycare for “exercise,” don’t! Instead, go walk your dog! You will get much more positive behavior out of your dog this way. If you allow your dog to beat the living daylights out of other dogs in order to tire them out, you will never achieve the socially acceptable dog you are looking for. Each time they see other dogs, they will walk on two legs until they get to mount, bite or assault the other dogs they see. And no, it is not really cute to the fearful or well-behaved pup you come across. It is pressure and causes dog reactivity. Even if your dog is “friendly,” it’s not appropriate for him/her to rush up on another dog to say “hello.” To put it in human terms, the happy “loving” drunk you see coming out of a bar that just wants to show you “love” by rushing happily up in your face and wanting to hug you, is probably not going to get a hug from you, right?? Even if they are happy, friendly and loving, it is inappropriate. Don’t let your dog be seen as the happy, loving drunk. So, then the question becomes, how do I tire my dogs out? If you have not guessed already, I tire them by slowly walking them…not running or biking them. You can run a dog for miles and after a brief power nap, they are ready for more. Why? You are training an athlete to run the marathons. I am literally walking my dogs at a slow pace with an occasional down command to just observe and admire the environment around us. I prefer my dogs to be calm, quiet, and peaceful, so I condition them that way. Do I play with my dogs? Of course I do! My play is fetch and down…fetch and down… tug, drop and down…high levels of excitement, lie down, etc. In return, my dogs, yes, you guessed it, lie down when they are excited. Please think about the behavior you want from your dog in all areas (home, public, with guests, etc.). Then you and your will be successful as long as you stay consistent with conditioning for the outcome you desire. If you need help teaching dogs to behave around other dogs, hire a trainer that does not believe in letting them beat the daylights out of each other. Proper adult canine behavior is calm and not pressured. Interested in more information? Please email us at k9workingmind@gmail.com, we have classes for Proper Play between Puppies and Proper Play between Adult Dogs. Stay calm and protect first! NEW Seminar’s on the schedule! New school year means it is time for Tara’s seminars again! All our Seminars require registration/payment prior to day/time. Please email us at k9workingmind@gmail.com to reserve your space. Learn how to foster and save a life confidently. You can help your local rescue or shelter and do so peacefully in your home. $50 per person, $35 per person with group of 3 or more. Humans only, 2 hour seminar. Snacks and drinks provided. Your dog’s language translated for you in a 2 hour workshop, real photos and videos- no illustrations. Humans only seminar. Snacks and drinks provided. Learn how to introduce dogs confidently and avoid pressure play between them at the same time. Calm introductions lead to long term benefits for your dogs, no pressure at the introduction, means no anxiety later. 3 hour seminar, snacks and drinks provided. Group discount of $50 per person with groups of 3 or more. Advanced reservations needed. Please email k9workingmind@gmail.com to reserve a space in any of the above seminars. At this time we do not ave any single classes on our schedule. Please email us at k9workingmind@gmail.com to request information or be placed on a wait list for our single classes! We look forward to helping you keep your dog protected and happy! Dominance Theory training, No thank you! For 26 years, I have consulted and worked with clients that own dogs that are either fearful, reactive, confident, resource or human aggressive. During our consultations, the owner generally states they are “alpha” to their dogs, or that they want to learn how to be an “alpha” to their dogs. I listen to the concerns about their dogs behaviors, and generally they are similar: the dog reacts to strangers or other dogs, redirects on the owner in an excited state, guards it’s food or bones, hides under items, has severe anxiety, or shows fear aggression when corrected. After listening to the presenting problem, I normally ask, how they have become an “alpha”, or what they think an alpha truly is. My question is, when does society praise? Do we endure so much “correction” from others in our lives, that we too feel the need to correct our dogs in order to feel superior? The corrections I have seen over the years range from physically rolling the dog, spanking the dog, using a prong or shock collar, and some tie a dog to an object and walk away. All of these so-called solutions are what we call dominance or “alpha” dog training. Dominance or “alpha” dog training is purely based on fear and pain, with the use of prong collars, shock collars, “alpha rolls”, abandonment and physical punishment to get the behavior the human would like. The problem is, with pain and fear the behavior we would like is not really going to happen. You are going to achieve fear, anxiety, lack of trust, and a dog that needs to protect itself from you, or the variables that caused the corrections in the first place. With pain and fear, you will be successful in making your dog an omega (the “punching bag” of the pack) in front of other dogs and people. This will make a dog try to display their strength even more to avoid being viewed as weak. You will also achieve increased reactiveness, and a dog with a high frustration level. This in turn results in a dog that shows extreme anxiety, and destruction of their surroundings (or sometimes themselves). If you were to observe a natural pack of stray domestic dogs, there is no full mouth biting for corrections, they are not inflicting pain on each other while they are walking together, and they are not attacking each other when another dog comes into sight. They are working together to protect each other, period. Spanking, prong collars, shock collars, rolling dogs, and thinking “a dog needs to understand you can take their life away” are not training techniques, they are fear and pain causing techniques used by humans that like to project their thoughts on canine behavior. Most times, dominance or train with pain trainers will explain the dog is aggressive because they are “power hungry”; when in fact they are not fighting for rank, they are fighting to survive. Survival is achieved with a strong protector in charge, not an unstable, confrontational one. Protective/positive based training, is all about teaching your dog that you can protect them, and that you recognize they did an awesome job. You show your dog his successes, repeat those successes, and build on his trust and confidence that you are a fair and understanding protector. This tells your dog you are not looking to make them an omega, you are not asking for “submission or fear”, but rather you welcome them to make mistakes, let them learn from them, and praise them for their success. Protective/positive based training teaches your dog exactly what you are looking for; there is no guessing on their end, it is clear through praise and reward. That reward can be anything, verbal praise, affection, playtime, massage, and yes treats. There is nothing wrong with using treats to pay a dog for doing a job well done. For those that feel treats should not be used, I ask you to work free of charge. You obviously do not need to be paid either, except with praise. Makes sense if this is what your belief is. So, when someone asks you what an “alpha” would do, or how they should become an alpha, tell them; “they would protect their pack with loyalty and dignity”. Dominance training is human, not canine. Caution, electric shock therapy ahead. The last couple of months, I have been contacted by several new clients with human aggressive dogs. Now this is not that surprising because I specialize in aggression cases, but the cases are unfortunately leading back to improper handling from professionals in the canine behavior field. I will not name names, or businesses and the point of this article is to educate owners of the potential danger of some training techniques being used. The following are real case files from owners that I have recently had. The only thing that was changed is the names, the rest of the material are the owners own encounters. I had been hired to help a gentleman with his dog “G”, a 10 pound 2.5 yr old mix breed. His presenting problem was constant barking and nipping at other dogs & at people. The barking started at 1.5 yrs old and the owner sought obedience training to curb it. The barking did not stop, but instead the dog started nipping at people. During the consult, each time the owner touched the dog it would show extreme signs of stress, yawning, lip licking, stress shakes/scratches. The tail would tuck with any touch. The gentleman was not threatening, heavy handed or quick in his movements; he was very gentle and kind. The entire hour the dog reacted this way, so I questioned the owner if he showed these signs at home and he admitted that he did. The owner said he had been a very “chill, laid back” kind of dog until a year ago. I continued the consult and asked him what commands the dog knows. There was a brief pause, and the owner looked down at his little friend and started petting him. He explained to me that he does not perform his commands very well, but his reaction looked like that of guilt not disappointment. So I asked how the commands were taught. He explained that they used an “e-collar” on him and he felt awful because the dog would scream and cry with every command given…. The owner now has a dog that used to be friendly and laid back, but with a little help from a professional, it is begun defending itself from humans and is even stressed by it’s own owners touch. I am not quite sure why anyone would put an e-collar on a dog to teach it basic obedience, what is the human race thinking when we do these things? Don’t you think if a dog screams and cries, there may be a problem?? I have a large dog pack; with patience and training I have taught my dogs how to be off leash, and do distance commands, yes with patience and training- not shock therapy. I have deaf dogs, they recall without shock therapy as well. They use their noses, sad to think we lost our creativity and have become this lazy in the field of dog training. Have we become so caught up in how fast we can do things, that we forget a little thing called compassion? I am appalled that someone could be this cruel and call him or herself a trainer. Trainer to owner: “Not sure why that one bothered him, I had already used the collar about 20 times.” Really? The dog had the patience for 20 tones (tones is what they want you to believe it is), and finally lost it on you and you are confused as to why? Really??? Ok let me give you the same scenario but with you, cause after all, if you think it is not going to hurt your dog in anyway, you should be fine with my little experiment. For one full day please place the same e collar on your neck. Forget your thigh like so many trainers tell you. The collar is placed in the neck, where their jugular is. (Some trainers even tell you to “shave” the neck so they can feel it more). Place it on your neck right over your jugular and fasten it so it is tight enough not to slip. Set it to the low setting and tell me the “tone” does not bother you. Now with every step- hit the tone, but remind yourself how awesome you are for taking the tone. “Good human”. Before you sit, tone yourself. Before you eat, tone yourself. If you are not happy with the tones at this point give yourself a better treat, maybe chocolate. There ya go all better right? Now, if you speak out of turn, or how any frustration to another human- remember crank it up and tone yourself. If you tone yourself the amount of times you tone your dog, (which obviously you cannot do) and by the end of the day you feel no stress, no headache, no pain; call me. I would love to do it again but with me holding the remote. I may not be as nice as you though. Screaming and crying after all, is acceptable. Up Coming Seminars- all seminars are people only please. A large majority of people mistakenly read certain cues as affection or fear, and some warning signs often go unheeded. This typically leads to an injury to the human resulting in possible death for the dog. This seminar covers how a dog communicates, including the subtle signs that could lead to potentially dangerous situations. We break down different stances, eye contact, actions and myths with real photographs and dogs for easier understanding. Our goal is to reduce the number of bite incidents, and help our colleagues and dogs understand each other without frustration. *All the photos during the seminar have been taken from cases I have personally worked with or my own pack members. Thinking of fostering but not sure how to introduce a new dog? Maybe you already foster, but would like things to go a bit more smoothly. This seminar is designed to show you how it can be done! Feeling overwhelmed? Maybe you are experiencing pack fights or scuffles? Let me show you how to have peace in your pack. All of my dogs came to me with aggression or reactiveness, and they all live peacefully together. It can be done. A seminar to teach you how to communicate with your disabled dog, this is based on my experience working with them. Real life pictures, and demo of how these amazing dogs live, love and learn, just like every other dog. They deserve a chance and I can show you how to rely on their other senses, regardless if they born this way or developed it at an older age. Agility for special needs dogs? Absolutely! People ask me all the time if special needs dogs (deaf, blind and deaf-blind dogs), can lead a normal life. Shelters rarely put them up for adoption, breeders tend to kill them at a young age (although this is never admitted), and rescues tend to have very strict limitations for any potential adopters, if they even do take one on. My question is, why? Why not give them a chance to lead a normal life? I own special needs dogs, and I have been training them without any issues for many years. Why would it shock or amaze anyone that a dog that cannot hear or see could do agility? Why do people think it is impossible to teach obedience to them? They adapt and can be conditioned, just like their seeing and hearing brothers and sisters. Other dogs do not see them any differently and I strongly believe we need to learn from our canine loved ones. In April of 2012, I was asked if Charlie, a deaf-blind dog, could enroll in our basic agility class. Of course I said yes! 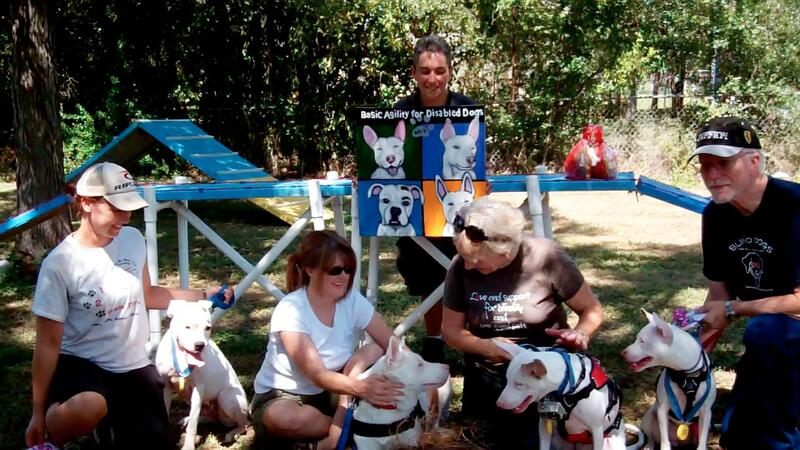 I have fought for, and stood behind my deaf dogs for years. I would never deny an owner or their dog, the right to reach their full potential. A colleague of mine asked me how I would teach a deaf-blind dog agility; my answer was, “he has a nose, I will use it.” It is the first thing a dog relies on, and their most powerful sense. If we teach dogs how to find the slightest traces of drugs that are masked by other scents, or people lost for days; why not use it to train them in other ways too. So Charlie enrolled in our basic agility class with four other classmates that could see and hear. We taught him how to maneuver the obstacles by different scents; carefully thought out as to what effect they would have on the dog (relaxing, exciting, non-offensive). He performed all of the equipment and learned them at the same pace as his classmates. His owner asked if I would consider doing an all special needs agility class, so again I said of course. I love all dogs and when I decided to get into this field, it was to help all of them; so why would I exclude special needs from any activities? I know my deaf boxer Flinn and my deaf-blind dog Gaia have no idea they have a disability. They adapt, as should we. Fast-forward to July 2012 and I had my first all special needs agility class starting, three deaf-blind dogs, and one bilateral deaf dog. I could not have been happier to see how involved the owners were and how much the dogs enjoyed the class. On August 4th, in just 6 short weeks, the class graduated. A very special moment for the dogs, the owners, myself and hopefully for the special needs dogs sitting in shelters waiting to be adopted. Below is a picture of the graduating class, I am very proud of all of them and I look forward to getting more information out there in hopes that others will do the same. Open your classes and doors to our special needs, adopt them out, let them lead the normal lives they deserve to have. Request that our city-funded TLAC facility be used exclusively to shelter Travis county homeless pets. The Austin City Council will meet this Thursday, May 24, to amend the license agreement between the City and Austin Pets Alive. In light of the last weeks crisis of overcrowding at the shelter, Travis County Animal Advocates is asking Travis County residents, rescue groups and animal advocates to write to the Mayor and City Council members to request that our city-funded TLAC facility be used exclusively to shelter Travis county homeless pets. 1. Please amend the agreement to allow the Town Lake Animal Center (TLAC) facility to be used as an Adoption Center by all rescue groups. As you may have heard, since March our City shelter has been experiencing record high animal intakes. The Austin Animal Center (AAC) has been managing TLAC as an overflow adoption site, and consistently has had to keep 50 to 60 dogs there to keep from having to euthanize them due to lack of space. We’d like to request that the amendment to the license agreement include available space for other rescue partners that have a need for kennel space. We’d like to see this great central location be kept as an offsite pet adoption location for all members of the community who can then come together to help Austin’s homeless pets find new loving homes. TLAC is a great City resource and has a long history in our community and we’d like to see it be kept as a City institution and resource for Austin’s homeless pets. 2. Please continue the language in the current license agreement that prohibits bringing homeless pets from other counties into the TLAC facility. Our community is at risk today of not being able to sustain its No Kill status. From what we are seeing due to the high animal intakes and the level of adoptions dropping, it is going to be near impossible to maintain No Kill for May and possibly into the summer months. Austin cannot afford to have pets from outside our community enter our facility and take potential adopters away from those pets that the City is trying to adopt out. We need all the available adopters in Travis County to adopt homeless pets from Travis County and not ones from San Antonio or the other surrounding counties that APA serves. We would like to see City Council go back to the original plan of using the TLAC facility as an Adoption Center for animals that come from the city shelter. Any rescue group or organization that uses our community’s TLAC facility should agree not to house pets from other counties at this site. Now that the pets being pulled from the AAC by APA are no longer just pets on the euthanasia list but are highly adoptable pets, TCAA would like to see the TLAC facility used as a high-volume adoption site for all AAC Rescue Partners. The location and popularity of the TLAC site would increase the adoption rates for all our Austin pets, thereby leaving space for pets in need of medical/behavior work at the AAC. The AAC has already begun working on medical and behavior programs for challenging cases, and is in desperate need of extra space in order to meet Austin’s goal of staying No-kill. By keeping the TLAC facility strictly for AAC overflow and for highly adoptable pets, this would help not only the city, but APA as well. APA has stated publicly on numerous occasions that they need to bring highly adoptable pets from other counties to fund their organization. While this may have been true when they only pulled animals from the euthanasia list, this is no longer the case now that APA pulls highly adoptable pets from AAC. 3. Please strengthen accountability and reporting requirements for animals housed at TLAC. No-kill efforts require accurate tracking of animals for accountability of the community’s investment and to ensure No-kill goals are met. We propose monthly reporting of animal status to the Austin Animal Center that not only includes intake into the TLAC facility and adopted and fostered from the facility but also includes adoption “returns.” We would like the reporting requirement to include brief description of: sick animals in rehabilitation, animals euthanized and animals that died. These reports should be required from any rescue involved in using the TLAC facility. If an animal welfare group agrees to accept community budget and space allocations and is part of the community animal welfare plan, then they must follow the minimum standards of care established by the Association of Shelter Veterinarians (ASV) in the 2010 white paper: Guidelines for Standard of Care in Animal Shelters. These guidelines are the current national “Gold Standard”. This will aid in the control of communicable diseases, protect community adopters, and provide a healthy, safe environment for the animals. In closing, I would ask that you, our City leaders, negotiate an agreement that best serves the interest of the Austin community and keeps only Travis County homeless pets in the TLAC location. Below are the email addresses of all the council members. Please help us help Austin stay No Kill. We came to Training by Tara to work on leash walking & basic manners. My favorite thing about the training was the emphasis on positive reinforcement, and you gotta love Tara’s advocacy for misunderstood breeds. Leo & I definitely recommend Training by Tara! 2 paws up! 1 word, Amazing! Our dog Sophie was having issues about lunging after bikes and SUV, she also pulled like crazy on the leash. 1 session for an hour and 4 weeks of us training her and Sophie is SOOO much Better, in fact, I might even say close to being perfect. If you are looking for a great trainer at an affordable price who will teach you and your dog everything she knows from decades of experience, GO HERE. Update on Bruno: I did manage to get one of the techs to come around the counter so I could “say hello and touch” with Bruno and then again to hand her the leash. Thank goodness Bruno was on his best behavior b/c she was not attentive to my request to hold the leash close with limited length dangling. I’m very proud of him. 3 weeks ago, this same tech took his leash from me and Bruno froze up and growled at her. Of course, my confidence IN him and myself has increased greatly so I was almost 100% (99.99999%) confident when I handed the leash to her today. Looking forward to many more training classes with you and your team. Hey Tara- thought I would share a milestone (or 2) with you: Carley hasn’t lunged or shown aggression on her walks in two days. Today she even had a dog come running toward her barking, a bicyclist rode by 3 times, and multiple “older” grey haired men that she normally lunges at, she has just walked on by!!! One day at a time 🙂 Thanks for all your help!!! Thank you Tara for opening our eyes to the fact that working dogs need a job. You have taught us patience, love and respect for the stubborn staffie! MASSIVE thx to @Trainingbytara Blue & I just had our life COMPLETELY changed by this wonderful woman.